Gale-force winds battered the Highlands yesterday causing significant disruption to ferries and travel. The highest wind speed recorded was 68mph at South Uist in the Western Isles. Shetland was close behind with 67mph wind speeds. Western Isles Council confirmed that Castlebay Community School closed early as a result of the stormy conditions and late buses were cancelled. The Met Office had a yellow weather warning for wind covering the Highlands, which remained in place until 3am today. A number of road bridges, including Cromarty, Dornoch, Kessock, Skye were closed to high sided vehicles. 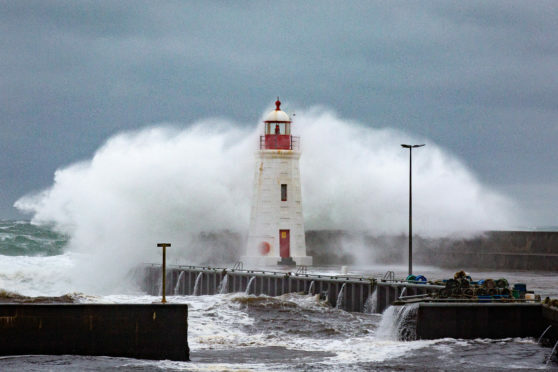 Coastal areas took a battering with high waves breaking over seawalls. It was particularly dramatic at Lybster in Caithness where the swell could be seen reaching as high at the top of the lighthouse. Ardrishaig Pier in Argyll was completely submerged. There was disruption on the A82 Inverness to Glasgow road when winds brought a tree down on the southbound carriageway at Invermoriston just after 8am. Road maintenance company Bear Scotland was called in to clear it. And ferry operator CalMac said there 24 out of 27 routes experienced cancellations or delays. A spokeswoman for the Met Office said last night: “The wind will ease a little overnight tonight and rain will clear away for a time. There will be a windy spell pushing up from the south tomorrow morning. That will reach southern parts of the Highlands around dawn and push northwards throughout the day across all parts. Ferry operator CalMac said: “High winds across the network have caused significant disruption with 24 of 27 routes experiencing cancellations or delays. There was also disruption on the Northlink Ferries to Orkney and Shetland. Ferry services will continue to be disrupted.